or “remember” signals for long periods of time, until these water masses are mixed again in the following years/decades/centuries and possibly far away (1000s of km) from their formation areas, driven by the general circulation, eddy shedding and general diffusion processes. While the average conditions of the oceanic circulation and processes have been studied and assessed in the past, direct observation of these water transformation zones has been very limited. It is challenging to observe the variability of the source (physical, chemical, biological) properties and volumes of these newly-formed water masses because the transformation often occurs on an “intermittent” basis, sometimes in localized areas (~100s km), during relatively short (days) episodes. These challenges require sustained in-situ observing efforts that are carried out throughout the year in relatively large areas, with high horizontal resolution because of the small scale circulation features involved. 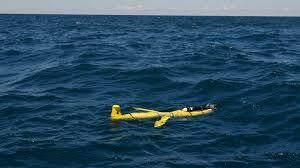 The observation of such phenomena remained a challenge until the use of autonomous underwater gliders in combination with more classical ocean observing techniques such as ships, floats and drifters. The OceanGliders Water Transformation observing network aims to develop sustained and integrated regional observing systems throughout the world, by sharing best practices, requirements, efforts and scientific knowledge, to address this critical issue. This paper analyses deep convection in the Northwestern Mediterranean Sea using a very large dataset. Observational data on temperature and salt content was collected from gliders, floats, ship cruises, and a mooring array. Using a combination of new instruments to study particularly challenging processes such as convection could offer a new approach to ocean observation. This is an introductory paper to a JGR-Oceans Special Section entitled “Dense water formations in the North Western Mediterranean: from the physical forcings to the biogeochemical consequences”. Many processes in the ocean operate on horizontal scales of less than 10km and changes occur in hours. The “submesoscale” dynamics are important contributors to the ocean dynamical state and have been identified to be of crucial importance for biogeochemical and biological processes in the ocean.